I forgot to mention yesterday that the ultimate tips in visiting Luxembourg Ville is to wear comfortable walking shoes (and thanks Cait for this tips too!). The city is small and easy to explore by foot, but also quite hilly in parts. Fancy shoes have no business on such stomping ground. Unfortunately, it also drizzled on and off most of the day, so you’d even want shoes with good grips. I went walking at Grund in the morning. Sitting in a valley between the two plateau of Haute Ville (where the old town is) and St Esprit, the quarter is picturesque and I bet would have looked even more amazing had the sky been more blue than grey. After a quick peek at the Natur Musée (i.e. Natural History Museum), I made my way to Musée d’Art Modern (a.k.a. MUDAM) which I absolutely love for the clever conceptual collections in place. In the afternoon, I visited the Grand Duke’s Palace (only open in June-August for 6 weeks for guided group tours) as well as Musée National d’Histoire et d’Art (i.e. Museum of History and Art). 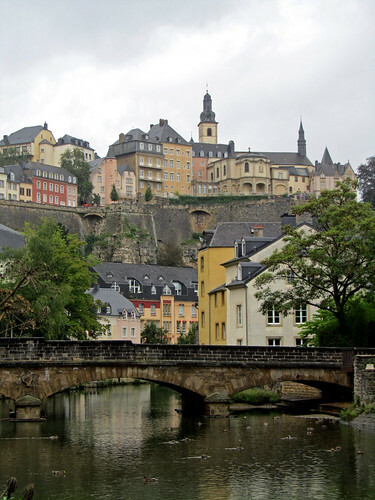 I love hearing about your trip to Luxembourg! You managed to fit in a lot! Did you by chance get a photo of the steps just inside the Natural History Museum, the ones with the pantone colour cards? I was kicking myself for not taking a picture of those. Yeah, come to think of it, I did lots! Unfortunately I don’t have a photo of the steps (it was very pretty) – not sure why it didn’t occur to me to do that. I did take a few photos upstairs in the colour-themed rooms.